Come down and be part of the fun!! Our Period Cooking went really well in 2013 and due to popular demand we are getting together monthly again in 2014. The format is simple; you can cook in advance or cook at the meeting. If you cook in advance please be ready to explain the cooking process. Please provide a recipe with your dish. We are looking for everyone involved to make one or more dishes in a selected category, appetizer, bread, entrée and desert. Please let us know in advance so we can plan. Also note the time change from last time. If you are not a member and are interested we only require you sign up to our Yahoo Board and be active in the group. We are not looking to just have numbers. We do not allow, gossip, trash talking other groups or drama. The conversation should always be on topic based on the meeting or post. For more info you can contact myself at ppackard0218@yahoo.com, Tricia at ladys218@yahoo.com or reach to us at the FTMS Yahoo board or the Facebook group. We have a temp site, we are now seriously looking at two indoor locations in the Taunton/Middleboro area. You will be required to bring your own personal protection. Philippe Provost is a Qualifiing Marshal under KOC/FTMS rules. Gisele Starkey and Aiden O'Malley are a Line Marshals under KOC/FTMS rules. They are both founders of the KOC and FTMS. 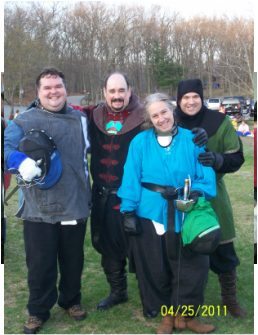 Both Philippe Gisele are also members of the LHA and use the LHA fencing rules to train our members. 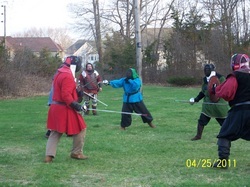 We will be having workshops for bucklers, RPGs, persona development and period Garb.